Founder & Chief Executive in charge of hatching Blue Egg and nurturing its growth and development of productions, products and services. Leannie founded Blue Egg Entertainment Inc. in 2006. Before restructuring into a production and training company, Blue Egg provided production accounting services to more than 10 films shot in BC. A life-long entrepreneur, Leannie started her first business at the age of nine. Delicious looking candles sold through one retailer. She is a fifth generation dancer and now with Blue Egg™ a third generation owner/ operator of a training studio. 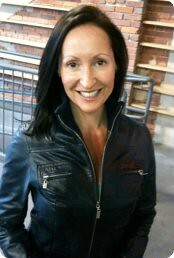 Leannie has 10 years of teaching experience in multiple styles of dance in addition to coaching drama. Before she was halted by a debilitating injury, Leannie trained for 15 years, and still trains today, in dance, acting and singing. A graduate from Vancouver Film School – Writing for Film and Television, in 2001. Leannie achieved the highest honour of her class, “Excellence”. Following her injury, Leannie chose to explore her passions for business & film. She has more than 12 years of experience in the Film Industry including, pre-production financing, production and postproduction. She spent several years working as a director’s personal assistant, and producer’s assistant. Leannie gained valuable insights into business building and management during the seven years she spent freelancing as a consultant and assistant to small business owners, working in eleven industries including Film. Blue Egg is truly the marriage of her Loves, training in the performing arts & producing entertainment.